How can you make more of a mark than the Mustangs did in 2017 when they finished 25-0 while being crowned national champions by USA Today? Well, just take a look at the roster. Of the 11 players who started in the 1-0 Class AAA championship game victory over Collierville, only two were seniors. 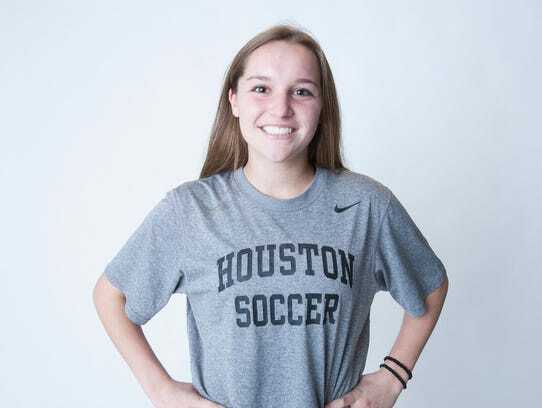 Houston is one of the local/Shelby County gilrs soccer teams that is consitently in the hunt, year-in and year-out for a girls soccer tittle in AAA. They have an awesome program over there. Dillution is the thing. Everybody wants the star players. You win with talent and coaching. It doesn't matter what would happen in the ISL (Imaginary Soccer league) of girls soccer in AAA in Tennessee. They have a dominant program. Good for them! Not imaginary at all. That group in travel is one thing and they go together to school. Williamson county is still good enough to compete every year for the state championship even though the talent is diluted over several schools. I don't know of a person that knows soccer talent in TN that would disagree. The IFL is your continual reference to the dillution of talent in Williamson County. Forget what they do in travel leagues because this isn't the travel league ... this is high school. Well, if you want to go play shoulda', woulda', coulda', then have at it, not that it'll do any good when high school teams meet up and play in good ole reality. That sounds about right wouldnt you say? Wait ... I gave Houston too many points! You are the one who brings up the Williamson County All-Stars, not me, and I'm the one making silly comments? Man, you are good for a laugh or two. You create drama where there is none. Its odd. I made a statement that is factual about the dilution of talent in Williamson county . I also congratulated Houston for their achievements and commented on the kids I know at Houston including the player in the photograph. Why you started all the hyperbole is beyond me? Its just silly to do it but its clearly your MO. Neither of us likes, or respects, the other but all this drama is really unnecessary and juvenile. Im done trying to discuss anything with you because you take everything to an extreme every time I post. Your first reply to a post if mine was just as immature as this last one. Feel free to get your last jabs in. Yeah, And if Caesar had B52s.... wow. At first I thought this came from Chattanooga. Shame on you. What an accomishment Houston. BooYah!!! No it is not ODD. It doesn't matter if your statement abot the Williamson County All-Stars is factual or not. They are NOT a high school team ... yet you see fit to interject a NON-high school team (Not even a team actually) into a post about a legitimate high school team. Who cares what a group of cherry picked All-Stars would do against a high school team? What's the point of even brining that into the discussion? If you could have just congratulated Houston and left it at that, there probably wouldn't have been an issue ... but NOOOOOOOOOOOO, you can't do that can you? You have to go bring up some non-high school Williamson County All Star team, that really isn't a high school All-Star team ... but a collection of club team soccer players, at that. LOLOLOLOLOLOLOLOLOLOLOLOL .... you keep me in sticthes over here! Houston is exceptional and I'm happy those girls come together to represent their community and their school. At the Bearden Tourney they were the "best in show" for sure.